Fulham was the location for one of the second phase of infectious diseases hospitals erected by the Metropolitan Asylums Board which had been set up in 1867 to administer care for certain categories of the sick poor in metropolitan London. The Fulham Hospital, serving the west of London, and its contemporary establishment, the Deptford Hospital, serving the south-east, were erected to provide additional accommodation for the large numbers of smallpox cases that continued in spasmodic epidemics in the 1870s. With the existing sites at Hampstead in the north-west, Homerton in the north-east, and Stockwell in the south-west, the two new hospitals created a ring of five serving the whole of the capital. The Fulham Hospital was erected in 1876-77 on a site to the east of Seagrave Road, Fulham. 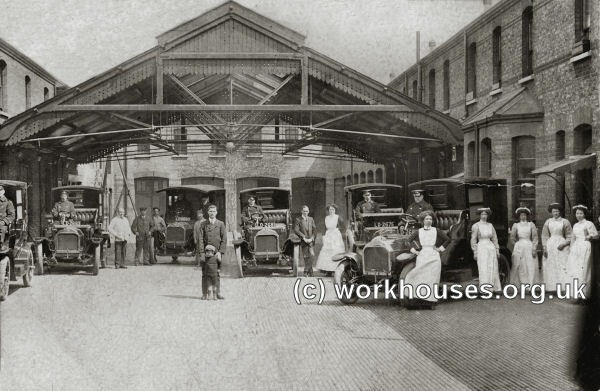 It was formally opened on 10th March, 1877, a week before its sister hospital at Deptford. The architects of both new hospitals were J Walker and W Crickman. Initially, only the central portion of the hospital was erected as a permanent structure, running east to west. This contained the administrative offices, staff accommodation, kitchen and laundry blocks. The ward blocks were planned to be temporary structures to be added when required. This turned out to be sooner than anticipated in the autumn of 1876 when a new smallpox outbreak occurred. It was then decided that ten ward pavilions should be erected, five to each side of the central buildings. Owing to the shape of the site the blocks were of different sizes, with those at the north being 144 feet in length, and those at the south being 133 feet. All the blocks were 24 feet wide by 14 feet high, and included a kitchen, lavatory and WCs. The wards provided space for 300 beds in total and the first three were ready for occupation by March 1877. The others were completed by the following May although it was then decided that two would initially be used for staff accommodation. The Fulham site location and layout are shown on the 1879 plan below. Plans were commissioned in 1877 from the architects A and C Harston for the addition of a porter's lodge, waiting room, and an ambulance shed at the north-west corner of the site. However, these buildings were not erected until 1883. This may have been because of strong local opposition to the presence of a smallpox hospital in the area. 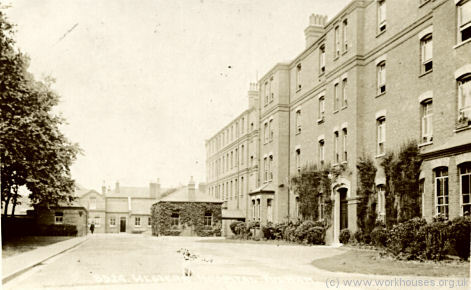 Ever since the first MAB Hospital had opened at Hampstead in 1870, there had been much public concern about the siting of smallpox hospitals in residential areas. In August 1881, during another smallpox epidemic, local residents applied for a court injunction to prevent smallpox cases being placed at the Fulham Hospital. A compromise was reached whereby only cases discovered within a one-mile radius of the hospital would be admitted. A detailed study of the spread of smallpox cases in the Fulham area was made by Local Government Board Inspector Dr WH Power. He concluded that the incidence of cases within a one mile radius of the Fulham Hospital was up to four times as great as in other parts of the adjoining districts. His report contained maps of the locations of smallpox cases such as the one below covering the period September 1878 to September 1879. Fulham area smallpox cases, 1878-9. In December 1881, a Royal Commission was established to examined the arrangements for dealing with infectious diseases in the capital. In its report the following year, one of its main recommendations was that smallpox cases should be treated in isolated hospitals on the banks of the Thames or in floating hospitals on the river itself. 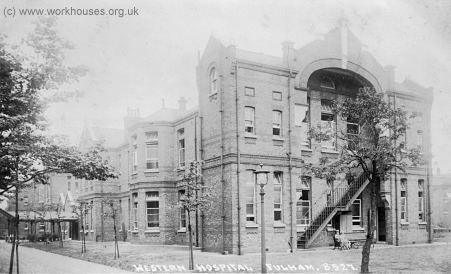 As a result, from 1884, the Fulham Hospital became primarily a fever hospital and renamed the Western Hospital. The majority of smallpox patients were then treated on the MAB's hospital ships Atlas, Endymion and Castalia, moored on the Thames at Long Reach near Dartford. In 1891, additional land was purchased at the south of the hospital on which to erect permanent fever wards. In the same year, new male and female staff blocks were built, and an additional storey added to the administration building. 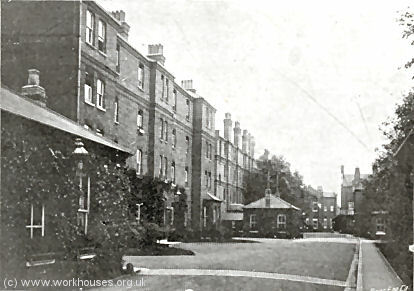 The following year, four new ward blocks were erected, again designed by A and C Harston. In 1893-4, the same architects were responsible for a new laundry, a mortuary and discharge room, and three further fever blocks. 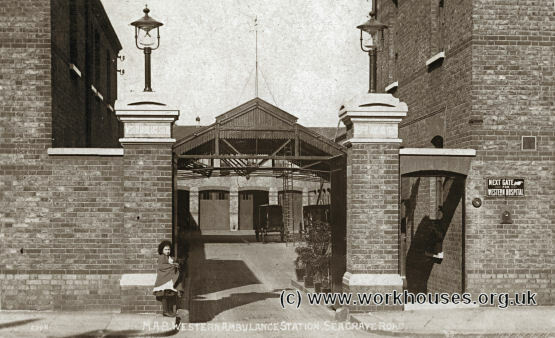 In 1930, administration of the hospital passed to the London County Council, at which time the site comprised an administrative section, an ambulance station, fourteen large ward pavilions, and a number of isolation blocks. In 1948, the hospital became part of the newly formed National Health Service. It closed in 1979 and the hospital buildings have now all been demolished. London Metropolitan Archives, 40 Northampton Road, London EC1R OHB. Holdings include: Administrative records (1872-1948), General (1872-1948), Admissions & Discharges (1897-1906). Charing Cross Hospital. Holdings include: Administrative records (1877-1951); Nursing (1877-1951); Clinical & Patients (1885-6); etc. 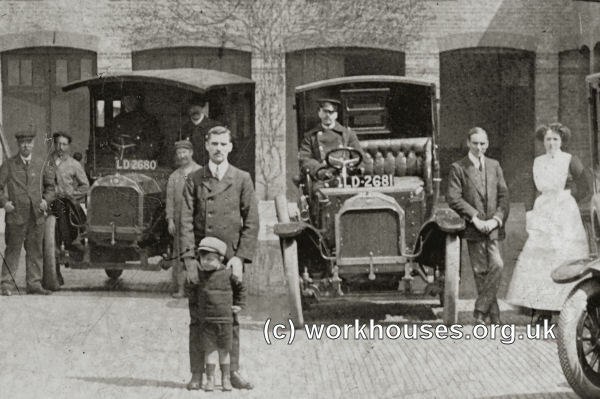 Hammersmith and Fulham Archives and Local History Centre, 191 Talgarth Road, London W6 8BJ. Holdings include: Administrative (1873-1979); General (1877-1968); etc. Power, WH Report by Mr. W.H.Power on the Influence of the Fulham Small-pox Hospital on the neighbourhood surrounding it in PP. 1882, XXIX, p368.